The textbook gives a detailed introduction to the basic physics and engineering of lasers, as well as covering the design and operational principles of a wide range of optical systems and electro-optic devices. Minta Martin Professor of Engineering Christopher C. Davis (ECE/ISR) has recently had published by Cambridge University Press the second edition of his textbook entitled, “Lasers and Electro-Optics: Fundamentals and Engineering.” The book covers a broad range of topics in modern optical physics and engineering. Deemed “invaluable for students studying laser physics, optoelectronics, photonics, applied optics and optical engineering,” the newly reorganized textbook gives a detailed introduction to the basic physics and engineering of lasers, a wide range of optical systems and electro-optic devices. 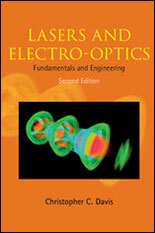 Davis’s book provides many practical examples of the design, construction and performance characteristics of various types of lasers and electro-optic devices. Davis also co-authored the best-selling text “Building Scientific Apparatus” in 2009. Both books were published by Cambridge University Press. Davis runs the Optical Communications and Sensors Laboratory and directs the Maryland Optics Group. His current research focuses on optical and RF directional wireless, real-time advanced surveillance systems with “event” detection, the optical properties of nanostructures, optical communication systems and devices, and studies of the biological effects of non-ionizing radiation.